Cowboy Baby (winner of the Smarties Book Prize Gold Award) has now grown into toddler Cowboy Kid. This companion book, boldly illustrated in bright colours, deserves to be well received. Cowboy Kid does not feel like sleeping. No Sirree! Sheriff Pa wants C. Kid to settle down for the night, but Kid thinks of many reasons why sleep is not yet on his agenda. This will be such a familiar tale to parents, and maybe especially to Fathers with responsibility for the bedtime rituals. Cowboy Kid's three special toys all get the treatment, big hugs, sleeptight kisses, bedsocks, scarf or special blanket to make them warmer, whilst Pa frequently pops in asking why Kid is still awake. More hugs, more kisses, and more desperate procrastinating! 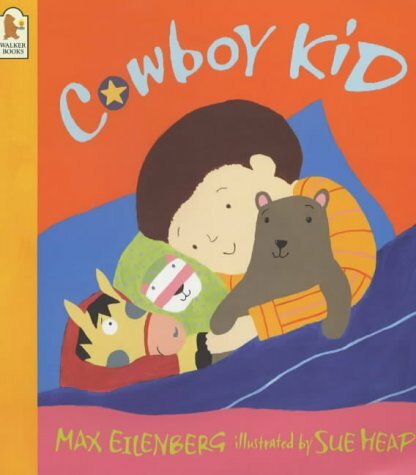 Cowboy Kid is now over-tired, but Pa's solution to his reluctance to settle is tender and quiet, and, 'Yes, Sirree,' all fall asleep with smiles on their faces.